Russian Diatkovo Glassworks and Imperial Glassworks are famous for their rich and large floral plaque paperweights, seals and blown apples. Recently discovered original price catalog from Diatkovo Glassworks proves, that they were made there in the last quarter of the 19th century. As Russian floral plaques and seals are better documented in limited number of existing today pieces, millefiori paperweights from Russian glassworks are much less investigated. but another examples may be provided on request, when available. Rare antique Russian glass plaque paperweight from Maltsov's Glassworks in Dyat'kovo. For reference I may provide scan of page from original trade catalog of Maltsov Glassworks, with Russian paperweights depicted. Original good condition with minor signs of wear. Dimensions: 16,5cm x 10,5cm x 5cm. Rare 19th c. antique Russian glass plaque with sulphide icon of Holy Mother of Kazan' from Maltsov's Glassworks in Dyat'kovo. Original good condition with minor signs of wear. Applied original brass hook. Dimensions: 12,2cm x 10,4cm x 2,2cm. Dimensions: 132 mm x 63 mm x 20 mm. More information and new findings on request. Rare antique Russian glass apple paperweight from Maltsov's Glassworks in Dyat'kovo. Mid-19th century Silesian glassworks Carlsthal, Hoffnungsthal and Josephinenhutte pioneerized in early 19th century millefiori and filigree glass techniques, used to make luxury glass objects like mugs, glasses, cutlery handles and other items - especially paperweights. These paperweights were produced before other well-known European glassworks managed to produce them, and are most classic from the 19th century classic period paperweights. 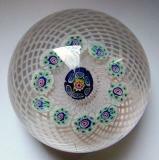 Bohemian glassworks followed Silesian millefiori success and produced paperweights in Polaun also in the end of the 19th century. Very rare antique Silesian Josephinenhutte double overlay tazza/bowl on paperweight foot. Very good original condition, internal crack inside base paperweight, as usual in most of a few known examples. Diameter: bowl 80mm / base 60 mm, height 90 mm. 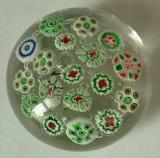 Rare antique Bohemian/Silesian millefiori paperweight. Depicted on p. 85, fig. 115 in "Glass Paperweights. 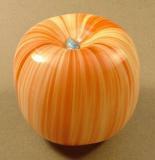 The Heritage of the 19th century Riesengebirge and Isergebirge Glassworks"
Diameter 57 mm, height 35 mm. Antique Silesian Josephinenhutte filigree vase. Antique Silesian Josephinenhutte crown paperweight. Original condition with signs of wear and large internal crack, as seen on photos. Diameter 66 mm, height 45 mm. Antique Bohemian pressed and faceted glass paperweight. 1862-1926 with busts of Miroslav Tyrs and Friedrich Fugner - establishers of Gymnastic Society "Sokol" ("Falcon") in Prague. Original good condition, minor scratches on the surface as seen on the photos. Diameter 95mm, Height 25 mm. Antique Bohemian/Silesian post-classic faceted paperweight with encased overlayed plaque engraved "Alfred". Diameter 80 mm, height 95 mm. 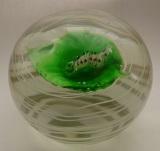 During mid-19th century paperweights revival, they were produced also in other glassworks like: Baccarat, St.Louis, Clichy, St.Mande, Pantin, Bacchus, Islington, New England Glass Co., Boston & Sandwich and others. 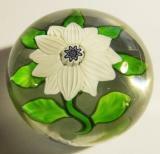 Very rare, antique Baccarat clematis miniature paperweight. White miniature clematis with this central cane is a unique example. Diameter 49 mm, height 30 mm. Extremely rare, antique Clichy filigree crown paperweight. Known in two existing examples. Very good original condition, minor signs of wear. Diameter 68 mm, height 50 mm, specific gravity: 3,1307, Clichy UV flourescence. Antique Belgium footed concentric paperweight with central rose cane. Original, good condition, minor signs of wear, two small chips on the edge of foot . Diameter 77 mm, height 45 mm. 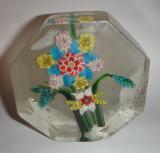 Antique New England Glass Co. millefiori paperweight. Original, good condition, minor signs of wear. Diameter 57 mm, height 38 mm. Antique St. Louis filigree scent bottle. Diameter 45 mm, height 92 mm. Old (20c.) 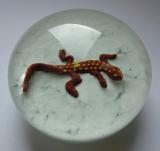 Venetian salamander paperweight. Diameter 74 mm, height 49 mm. Pantin pattern, vintage - probably early 20th c. silkworm on leaf paperweight, unknown maker. Diameter 74 mm, height 60 mm. Antique (late 19th c.) Venetian micromosaic paperweight. Original condition, one corner missing. Dimensions: 97 mm x 69 mm x 16 mm. 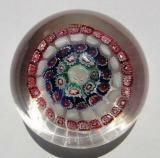 Rare millefiori basket paperweight by Tomasz Gondek from Poland. 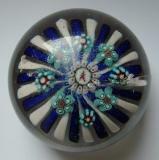 Tomasz is working close to Josephinenhutte and revived millefiori paperweights art in Silesia. Diameter 77 mm, height 56 mm.